The Sweet Smell of Stink … Stink Moody, That is! I had the privilege of sitting down with popular and inimitable author, Megan McDonald, at the L.A. Times Festival of Books last month. She’s the brains (and humor) behind the successful Judy Moody and Stink Moody series. We met to discuss the 10 year anniversary of the STEM-oriented Stink Moody books being celebrated by her publisher, Candlewick Press. Good Reads With Ronna: If Judy’s an exaggerated version of you, who have you modeled Stink on, or is he a conglomerate of your sisters, or totally from your imagination? Megan McDonald: Well it’s interesting because Judy and I have so much in common with our messy hair and all of our moods, but really in a way, Stink is the one who is close to my heart because he’s the youngest. And even though he’s a boy, and I had four older sisters, and a lot of the funny stories I tell are based on the stories growing up with all these sisters, I imagined a boy because I never had a brother. And then, because he’s the youngest, I know what it’s like to have that bossy big sister. You know, who sort of thinks she’s in charge and knows it all and wants to boss you around. I empathize a lot with Stink. And making him be the shortest kid in the class; in the first book he’s very sensitive about his height, and he wants to grow, that was all coming from my empathy for Stink being the youngest. GRWR: Is it difficult for you to switch from being in the head of Judy to being in the head of Stink? In other words, does keeping their individual perspectives get tricky when both characters are in a story? MM: Yes. At the beginning it really was because even when I go to write other books, the voice of Judy will be in my head and start to take over. 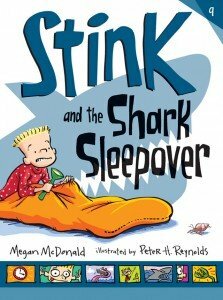 So with Stink, whatever the book is going to be about, like if he’s going on a shark sleepover or he’s going to save the planet Pluto, I sort of just immerse myself in that universe and learn about Pluto or go to the aquarium and watch the sharks and really try to set an atmosphere for Stink just to get my head out of the Judy thing. At the beginning it was really hard because even when Judy would come on stage, so to speak, in a chapter, she would start to take over and I had to keep reigning her in and letting Stink have his say. GRWR: I thought you did a terrific job, especially in Stink and The Shark Sleepover because Judy is never domineering. MM: At first I was going to have Stink go on the sleepover without his family. But then I thought it would be really fun to see Judy in the older sister role in a different capacity. So when the kids are kind of scared, and they want to know what’s behind the big KEEP OUT door, and they see the light under the crack, it’s the perfect thing. You wake up the older sister and say, “C’mon, we’ve got to go find out what’s behind the door!” Then she can go fall back to sleep leaving Stink to think about putting toothpaste in her sleeping bag or whatever. GRWR: What are the qualities in Stink that you admire the most? MM: I guess I really admire his passion. You’ll notice there are not a lot of electronics and computers and things in the books … so from the very first book Stink is always reading the encyclopedia. I had a nephew who always did that. I don’t know if it was because it’s just what was around, but he’d pick up a volume of the encyclopedia and he’d disappear. It kind of started with that, with Stink picking up the S volume and he’d be reading about Skinks or Saturn or whatever the S word of the day was. And then I realized I never set out to make it about science, but I realized he really had the passion for all these things, whether it was animals, or Pluto, or sharks or saving the guinea pigs or whatever it is, and I love how this passion comes through. 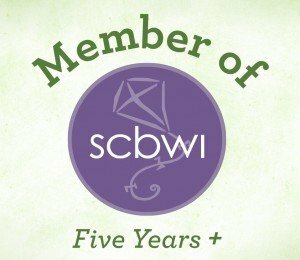 GRWR: What do you do to find inspiration for your stories? Tell us about connecting with your inner child – how do you do it so convincingly? MM: Well growing up with four sisters really helped. In the first book, especially in Judy Moody, I did tell actual stories. The famous story of the fake hand in the toilet, in the first Judy Moody book, is a real joke that I played on my sisters. And that really happened where they went to the White House and I stayed home. So it started out with the idea of using some of these funny stories of growing up with all these sisters, but Judy really took on a personality of her own. And Stink was his own person from that first book, so it’s sort of branching out more into my imagination. And people say to me, “But how do you go back? How do you remember all these things? It’s like you know, you remember everything from when you were eight years old!” I really don’t. I love the Mark Twain quote where he says, “I remember everything whether it happened or not.” That’s kind of how I feel. I remember certain things and feelings from childhood, but whether it happened or not, I can easily add imagination and embellish and make it into a funny story. 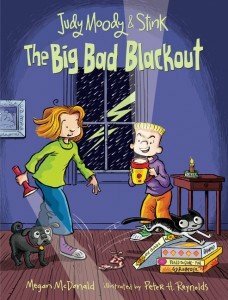 Ronna: So in Judy Moody & Stink: The Big Bad Blackout, did that hurricane really happen? MM: Ah, that’s interesting. I got the idea because I was on tour in the state of Virginia where Judy and Stink are from. I just happened to be there right after a hurricane, I think it was hurricane Isabella. So all these people, this was more in the early days of Judy Moody, were coming through my signing line and telling me we found Judy and Stink, we discovered Judy and Stink in the hurricane. I thought, “What, the books washed up?” And they would say no, all the lights went out, there was no electricity.” They couldn’t watch TV, they didn’t have computers, laptops, iPads. They had flashlights, or they lit a candle and they read books. 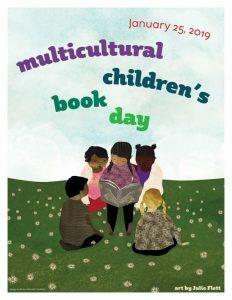 The whole family would get out a Judy Moody or a Stink book and they’d read aloud by candlelight. That just gave me goosebumps. So many people told me this. They would talk about playing board games, going back to the things of my childhood. This really made an impression on me and I thought I would love to have Judy and Stink experience a blackout. You know, have a hurricane come, not a scary one, but the electricity’s out and they have to find ways to be entertained, I guess. You don’t have all the electronics if you take away the lights and the electricity. So of course Grandmas Lou comes. She shows up with an entourage of all these animals with her and then the lights go out. What do you do? You roast marshmallows in the fireplace and you tell stories, right? That was really fun because I got to tell several stories within a story. GRWR: What’s the most meaningful or hilarious response from a kid regarding your Stink books? MM: It’s funny you ask, because I was just Skyping the other day because Pizza Hut had a reading month and they chose Stink as their mascot for the month of March. One of the prizes, it was for teachers and their classroom, was to win Stink books and they got a Skype visit with the author. So I was just Skyping with the fourth grade classroom who won the prize. The teacher told me ahead of time that the kids all had prepared questions. It’s their questions. She didn’t weed them out or anything. They each had to come up to the camera and they got to ask a question. One little boy came up and he asked, “What do you do when you’re angry?” I think he was thinking about Judy and all her moods and so he wanted to know how I handled being angry. I told him all about the newest Judy Moody book, Judy Moody Mood Martian and in that book Judy tries to stay in a good mood for one whole week, but it’s very difficult. So, when she feels a bad mood coming on she gets out her finger knitting. It’s knitting you can do without needles. And I’m there on Skype explaining finger knitting to the kids, showing them my fingers and how you can wrap yarn around them and everything. And that’s what Judy does. I said for me, I usually go walk the dog, or go take a swim, or just do something to help get that energy out, but finger knitting was a way Judy found she could channel some of those feelings. He said thank you and he went to walk away from the camera and said, “Well I guess now I have to go home and take up knitting.” (Laughter) It was very cute, sweet and very funny. He really took it to heart. GRWR: Do you have a favorite Stink book or situation that remains outstanding in your mind after 10 years? MM: Oh gosh! So many favorites. 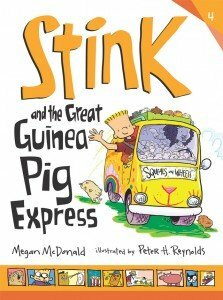 One that I really love is, it was probably the most difficult to write, is the one about Stink where he rescues all the guinea pigs, Stink and The Great Guinea Pig Express. I had read about these guinea pig rescues that had happened. And there was a woman in the Bay Area who heard about these guinea pigs in a lab that were being mistreated. They shut down the lab and she brought all these guinea pigs home. And she thought. what am I going to do with 101 guinea pigs? She got a bus from the Humane Society, then went online, found homes for these guinea pigs all over the country, loaded them up in her car and went on a guinea pig rescue tour, giving away the guinea pigs to good homes. When I read this I was so inspired that I had this inspire Stink. He finds out about these guinea pigs at the pet store and with the help of the woman from the pet store, they get a bus, outfit it and they go all over Virginia and find homes for all of these animals. So it was a really fun one because it has such heart. You just want these guinea pigs to be well and be safe and find good homes; also it’s hilarious because you can just imagine being on this little van or bus with 101 squealing little guinea pigs and all of the antics that would go with it. GRWR: That’s super. I just love how you come up with things like squeals on wheels and you have asteriod and then the blasteroid. Does it come easily or do you spend a ton of time thinking those up? MM: I love to play with language, and I grew up with a lot of nonsense poetry and even at the dinner table my mom and dad we would have pun contests. I’ve always loved that word play and that language play. Sometimes it just comes naturally when ryhming or something will pop in my head. Other times it’ll just be almost be like a gift. I’ll be doing some research or something and exactly the thing I was looking for just sort of lands in my lap. So when that happens those are really special moments for a writer. GRWR: If you were asked to create a “me” collage, like in Judy’s first book, what would you include in it? MM: Oh, gosh, um. Well, I don’t have the Barbie Doll heads and scabs I collected as a kid, but I do have a lot of collections. Judy and I are both collectors. So I collect things like erasers, sock monkeys and mood rings, so some of the Judy Moody things you’re probably familiar with go in my collage. MM: Yes, of course. I have a killer BAND-AIDS® collection including bacon strips. GRWR: Oh I like the bacon strip ones! MM: Now of course people know that I collect them they send me all these funny ones. Pirate ones, sock monkeys and all sorts of neat ones. Yes, definitely the BAND-AIDS®, and a grouchy pencil or two. And other than that, probably just things, you know from my own life, pictures of me with my sisters when we were little. We have a lot of those black and whites from when you used to go in photo booths and make funny faces. You know, that sort of thing. But a lot of the things in Judy’s world are things from my own childhood, too. GRWR: What can we expect to see Stink getting up to in his next book? MM: Okay, well the next book is Stink and the Attack of the Slime Mold. It’s bringing Riley Rottenberger to the forefront. She’s sort of the Stink nemesis of it. He gets to Saturday Science Club and Riley Rottenberger is there and it turns out in this club that they were going to learn how to grow slime mold. So they each take home their little samples of slime mold and it begins to grow. And it’s really gross and slimy. Stink starts to imagine that this slime mold, you know you only feed it like one Cheerio or one oat flake, but he starts to imagine that’s it going to take over his room and begin to take over the whole house and the whole planet. So that’s a fun one. There’s a lot of science in it where you can learn about the actual slime mold which is an amoeba. It’s a one celled organism. But it’s also very science fiction-y. It opens with Stink and Judy going to a drive-in with their parents -they’ve re-opened an old drive-in, and the Blob movie is playing. That kind of gets Stink’s imagination going, so the comics will feature, you know how there are comics after each chapter, some of the more fantastic, science-fiction-y aspects of the book. GRWR: Is it done? Or if not, when is it due out? MM: Yes, my part is done. Peter [H. Reynolds] is working on the drawings right now. It comes out, I think, spring of next year, 2016. GRWR: Okay, and what about Judy’s book, the one you mentioned earlier? MM: That one is out. 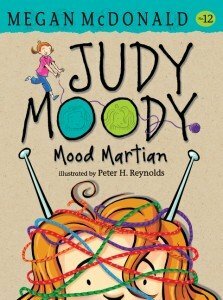 That came out last fall and is called Judy Moody and the Mood Martian. It’s still in hardback; it should come out in paperback this summer. 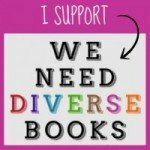 GRWR: What contemporary kids books are you reading now? MM: Well, right now I’m reading Pam Muñoz Ryan’s book called Echo. And I almost couldn’t even come to Los Angeles because I only have 20 pages to go, and I’m like I can’t carry this thick 600 page book … that I just have to finish now.. It’s in 3 different time periods, 3 different stories, and I just have to know how they all weave together. It’s a fascisnating historical novel. I’m a huge Katherine Paterson fan so I went back and I’m filling in all the holes in my Katherine Paterson collection because I discovered there are books of hers I’ve never read. Some of the ones that are set in Japan that were some of her early ones. And Come Sing, Jimmy Jo. So I’m going back and reareading some of those. But The Great Gilly Hopkins is probably one of my most all time favorite children’s books – for children. GRWR: Wow! Good to know. MM: And from my childhood, Harriet the Spy, of course. GRWR: Of course, of course. Which reminded me, you used an expression which tells me that you and I are of the same generation, the Screamin’ Mimi’s Café, where they go for the ice cream, but I don’t know if kids of this generation know it. I don’t even know where it comes from, but I grew up knowing about screamin’ mimis. … I was so drawn just by the name Screamin’ Mimi’s. And then in the early days I asked her if I could use the name of the shop in the book since it was going to be an ice cream shop. She said sure but don’t use any of the flavors I make because I might want to trademark them. Well now, the poor woman, kids come from all over the country and go to Screamin’ Mimi’s and they ask for the flavors that are in the book that I just made up! She said, “Oh I wish I would have let you use my flavors!” Now she makes the actual flavors for special occasions that are flavors from the Judy Moody books. Right, who’s ready for a big scoop right now? A huge thanks to Megan McDonald for generously giving of her time during such a busy book fair day, and to Candlewick Press for giving Good Reads With Ronna the wonderful opportunity to chat with Megan McDonald. Interview by Ronna Mandel with special thanks to Armineh Manookian for her huge help. In The Mood to Win Lots of Judy? CONGRATULATIONS TO CONTEST WINNER ROBIN BAILEY-CHEN! Judy Moody and the NOT Bummer Summer! To help celebrate the film’s June 10 opening, we’re giving away a set of 5 new books from Candlewick Press tied-in to the film that you will not want to miss. Enter by clicking here for your chance to win. Be sure to write NOT BUMMER SUMMER as the subject. For rules, please click here. This contest ends Monday, June 6 so don’t wait and good luck! 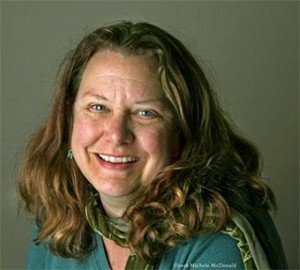 Read calendar editor Michael Berick’s interview with author Megan McDonald here. First there’s the paperback, Judy Moody and the NOT Bummer Summer based on the screenplay by Kathy Waugh and Megan McDonald ($5.99 ages 6-9). Throw in some Judy, her brother Stink, mix it up with Aunt Awful (er, Opal) and that makes for a most very B O R I N G summer. How to make dudsville into a thrill-a-delic summer vacation? Read on.